Investors and analysts grossly underestimated growth in the Asian nation. And now price targets are rising. NEW YORK (TheStreet) -- For all the worries about Apple ( AAPL - Get Report) failing to live up to lofty expectations, the company has one word for the doubters: China. Apple is generating record revenue growth in mainland China, thanks in large part to a deal with China Telecom ( CHA - Get Report) during the fiscal second quarter, as well as an expanded relationship with China Unicom ( CHU. IPhone sales in China had staggering growth in the second quarter. CEO Tim Cook said yesterday on Apple's earnings conference call that it was an incredible three months in China, which produced $7.9 billion in revenue, up three-fold. Perhaps that makes perfect sense since Apple's products are made in China (though they're "designed in California," as the company says on its devices). "So it is mind-boggling that we can do this well," Cook said. The Cupertino, Calif.-based company generated $12.4 billion in revenue from China in the first half of fiscal 2012, compared with $13.3 billion for all of last year. Many analysts didn't see such a bullish earnings report coming. Apple bulls such as Piper Jaffray's Gene Munster had forecast 33 million iPhones, Hudson Square's Dan Ernst 28 million and Barclays Capital's Ben Reitzes 32.97 million sold during the quarter, well below the 35.1 million actually sold. Goldman Sachs analyst Bill Shope noted that Apple's growth in other countries outside the U.S. may now be the most important component for Apple. "International share gains and growth in China, in particular, should be a greater factor for iPhone and iPad growth over time, and it also should be a key driver of upside surprises in the near term. Indeed, when looking at Apple's overall revenue growth in China, it's becoming clear that Apple's emerging market momentum may be the most important component of the revenue story," Shope wrote in a note to clients. He raised his price target to $850 from $750 and rates the shares "conviction-buy." China will be a tremendous opportunity for Apple, as it continues to expand into the country, especially once Apple brings the iPhone to China Mobile ( CHL, the country's largest mobile carrier. Apple sold the most number of iPhones for any period except the first quarter. Apple generated earnings of $12.30 per share on $39.2 billion in revenue for the second quarter. Analysts polled by Thomson Reuters were looking for earnings of $10.02 a share on revenue of $36.69 billion. A total of $22.7 billion of revenue was from the iPhone, now available in more than 100 countries, and none of more importance than China. The importance of China cannot be understated, said Channing Smith, manager of the Capital Advisors Growth Fund. "China is very important, and China will be an enormous growth market. What I'll be interested in seeing is the sustainability, and I want to see if they can replicate what we've seen in the U.S. in other countries." Smith owns Apple, but isn't adding to his fund's position. The growth in China is staggering, and as Apple brings China Mobile online, there may be more surprises ahead. Barclays Capital's Reitzes, who rates Apple shares "overweight," says the iPhone's China sales was the earnings report's highlight. He raised his price target from $730 to $750. Piper Jaffray's Munster was stunned, saying the international story for Apple is just beginning. "Given Apple's commentary around China growing five times year-over-year, our confidence that Apple can win with an iPhone in emerging pre-paid markets is greater than ever," he wrote in a note. Munster rates Apple shares "overweight" with a $910 price target. 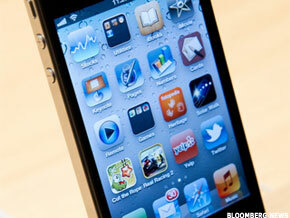 Wall Street analysts such as Jefferies' Peter Misek and others had become fearful of slowing iPhone sales. Misek cut his second-quarter iPhone estimate to 28 million to 30 million units, based on comments from AT&T ( T - Get Report), and Verizon ( VZ - Get Report) on first-quarter iPhone activations. Misek rates Apple shares "buy" with an $800 price target. Apple's China sales don't take into account the iPad tablet, which isn't yet for sale on the mainland. The company sold 11.8 million iPads during the quarter. Cook said Apple has expanded "a lot" in China, but there's plenty of room for it to be a greater opportunity. And once the iPhone 5 is announced (many are expecting an October launch), China's importance will be even greater. Shares of Apple are soaring in early Wednesday trading, up 9.9% to $615.56.